A solo by Helen Bell (soprano) singing the first lines of the title piece, an arrangement of Barry Manilow’s One Voice, started the annual summer concert. Helen was joined first by Howard Feather (tenor) and then Frances Brightman (alto) before the whole choir joined in. One Voice was followed by the spiritual Michael Row the Boat Ashore and Rebecca Joisce (soprano) singing the Joni Mitchell song, Both Sides Now, accompanied by Terry Pearce on the guitar. A selection from Gilbert and Sullivan began with the choir singing arrangements by Nicholas Hare of Brightly Dawns Our Wedding Day from the Mikado and Eagle High In Cloudland Soaring from Utopia Limited. Howard Feather then sang Take A Pair of Sparkling Eyes from The Gondoliers before the choir sang I Hear The Soft Note from Patience. After we heard about the trials and tribulations of being an alto in the poem, Alto’s Lament (read by Caroline Miller) the altos had a chance to shine with I’m Called Little Buttercup from HMS Pinafore. The first half of the concert continued with the full choir singing the hymn, Be Still My Soul (words by Veikko Antero Koskenniemi set to a section of Finlandia by Sibelius) and Abby Evans (alto) singing On My Own from Les Miserables. Next came the rousing Gonna Rise Up Singing by a small group from the choir (Helen Pearce, Trish Napper, Caroline Miller, Mo Hunt, Vivienne Dann, Hugh Hercus, John Hunt, Edward Dann and Terry Pearce). The first half ended with the choir singing An American Trilogy – a medley of three 19th century songs (Dixie, The Battle Hymn of the Republic and All My Trials) made popular by Elvis Presley. Two pieces from the well-known musical My Fair Lady started the second half. The first one was a solo by Hugh Hercus (tenor), On the Street Where You Live. The second was I’m Getting Married In The Morning sung by the Steventon Church Choir and friends with Terry Pearce (bass) as Mr Doolittle. The full choir then sang two pieces from the musical Chess – I Know Him So Well and Anthem. We then remembered 1914 and the commemoration of the centenary of the beginning of the World War One with two songs – Vilja and Love Unspoken Faith Unbroken – sung by Helen Pearce (soprano) from the operetta Merry Widow by Franz Lehar, which was popular at that time, and two songs frequently sung by the troops as they marched – It’s A Long Way To Tipperary and Pack Up Your Troubles. The second half continued with the Songbirds (Helen Pearce, Rebecca Joisce, Helen Bell, Frances Brightman and Abby Evans) singing arrangements of the Rhythm of Life from the musical Sweet Charity and the rock hit from Queen, We Are the Champions, written by Freddie Mercury. This was followed by the choir singing Climb Every Mountain from The Sound of Music and the The Lion Sleeps Tonight (a song also known as Winoweh which was used in the film The Lion King) and A reprise of One Voice ended the concert. The concert opened with an anthem by John Rutter, I Will Sing With the Spirit. This was followed by the main piece for the first half, Schubert’s Mass in G, with soloists Helen Pearce (soprano), Howard Feather (tenor) and Terry Pearce (bass). The first half concluded with another Rutter anthem, Look at the World. A duet by Helen Pearce (soprano) and Rebecca Joisce (mezzo-soprano) Stabat mater dolorosa by Giovanni Battista Pergolesi opened the second half of the concert. This was followed by an arrangement of Pachelbel’s Canon in D sung by Helen Pearce, Rebecca Joisce, Helen Bell, Frances Brightman, Abby Evans and Terry Pearce and The Heavens Are Telling from The Creation by Haydn (soloists: Rebecca Joisce, John Hunt and Terry Pearce). The feature work of the second half came next – the choral suite from The Armed Man by Karl Jenkins (Kyrie Eleison, Sanctus, Benedictus, Agnus Dei and Hymn Before Action) with Helen Bell as soloist in the Kyrie Eleison. The concert concluded with The Peace of God by John Rutter. 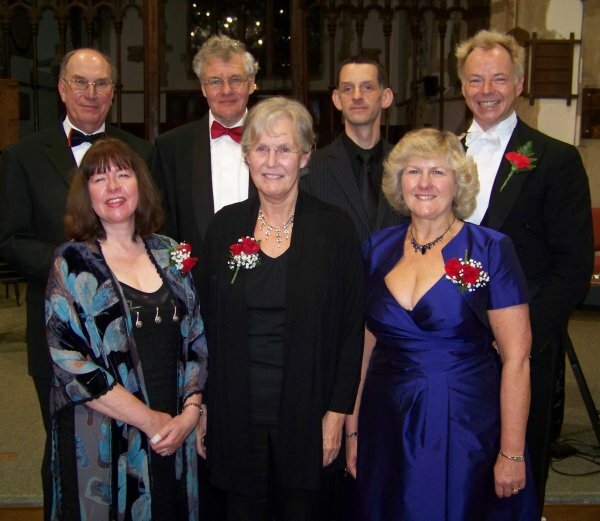 The first concert raised £460 for the piano fund at St Mary’s Church, Streatley. 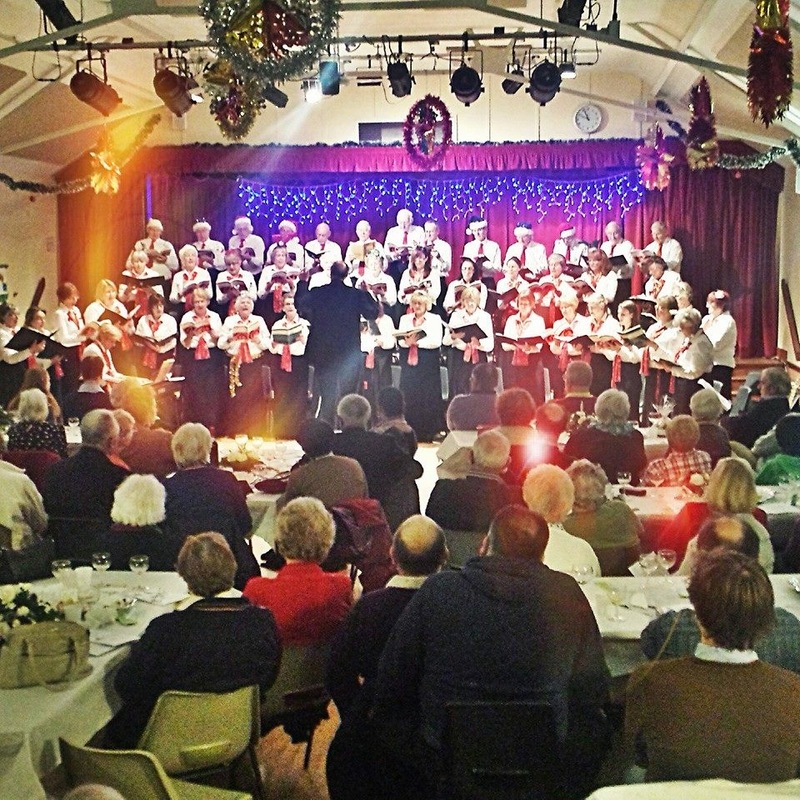 The second concert raised £330 for St Michael & All Angels, Steventon. The traditional carol, Ding Dong Merrily on High, was the first sound of Christmas. This old French tune was followed by an old Welsh carol, Deck the Hall, before Jingle Bells jumped us to the twentieth century. The audience then had a chance to join in with Good King Wenceslas and A Child This Day Is Born. 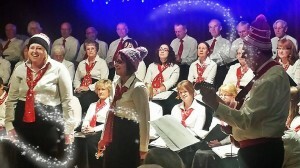 A different sound of Christmas was provided by Rebecca Joisce who sang unaccompanied just seven of the many verses of This Is The Truth – a folk carol also known as the The Truth Sent From Above which is thought to have originated in Shropshire/Herefordshire. The next item, a duet by Abby Evans and Frances Brightman (accompanied by Terry Pearce on guitar), brought us back to more modern times with the Wham hit, Last Christmas, written by George Michael. The choir then sang Colours of Christmas, the first of two John Rutter carols in the concert. This was followed by the traditional carol, List Our Merry Carol, the well-known Christmas song, Winter Wonderland, and an arrangement of the traditional carol, It Came Upon the Midnight Clear. Another solo was next, this time from Helen Pearce who sang Gloria In Excelsis Deo from the Christmas cantata, The Flower of Bethlehem, by Eric Thinman. The second group of audience carols, We Three Kings (the ‘kings’ were Martin Blogg, Hugh Hercus and John Hunt) and The First Nowell. The first half ended with three popular Christmas songs – Frosty the Snowman, Walking in the Air and Mary Had a Baby. The second half began with what has become a Steventon Choral Society tradition – a light-hearted number from the choir’s own group of dancers who this year, assisted by no less than three Father Christmases, performed Santa Claus is Comin‘ to Town. John Hunt then told us the story of a little boy who wanted to be a star in the school nativity play but came up with different reasons why he didn’t want to play any of the parts. Then it was back to singing, with another two audience carols, Once in Royal David’s City and Hark the Herald Angels, and the choir performing a new ‘find’ this year – a Christmas benediction, A Christmas Blessing, written by Philip Stopford in 2008 for Nine Lessons and Carols service at Belfast Cathedral using words from the Church of Ireland Book of Common Prayer. The choir then sang a carol it has sung many times before, O Holy Night by Adolphe Adam (soloist: Helen Pearce) which was voted the Nation’s Favourite Christmas Carol in 2013 in Classic FM’s poll of listeners, repeating its success in 2012. The next item, Angels by Robbie Williams and Guy Chambers by a quartet of Helen Pearce, Rebecca Joisce, Abby Evans and Frances Brightman (accompanied by Val Cooper on keyboard) was first released in 1997. The quartet was then augmented by Helen Bell, Dannielle Beeken and Val Cooper in Twelve Days or So of Christmas – an arrangement by Paula Foley Tillen of the well-known song. The next piece by Steventon Church Choir, whose members all belong to Steventon Choral Society, was the Advent anthem, Come Lord Jesus by Martin How. The choir then returned to sing Christmas Lullaby, the second John Rutter carol of the evening, and an arrangement by its musical director, Terry Pearce, of When a Child is Born by Fred Jay and Zacar, and made popular by Johnny Mathis in 1976. The last audience carol, O Come All Ye Faithful, was followed by an arrangement by Henry Geehl of Silent Night sung by Helen Pearce, Trish Napper, Helen Bell, Dannielle Beeken, Abby Evans and Frances Brightman (accompanied by Val Cooper on keyboard). The Hallelujah Chorus from Handel’s Messiah sung by the full choir brought the concert to a rousing end. A choir of some 60 singers made up of members of Steventon Choral Society and friends presented a sing-in of Handel’s Messiah in a concert on World Hospice & Pallative Care Day in aid of Sobell House, Oxford, as part of Voices for Hospices 2013. 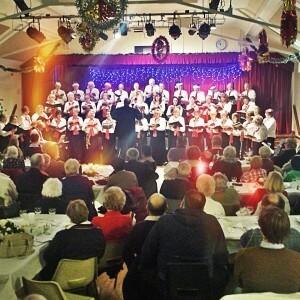 The concert raised a total of £1447.15 for Sobell House.